Habitot is a hands-on museum for young children, toddlers and infants. Fun activities, hands on exhibits, arts and crafts, fun classes, music and much more. Museum admission applies. Come join us for 45 minutes of music and play, including rhythmic rhymes, songs and instrument play on Mondays at 10–10:45 am. During this lively session, young ones learn traditional folk songs and hands on music and circle games. The class is informal, non-performance-oriented and developmentally appropriate for children and parents/caregivers. Join us for an ongoing drop in group on Tuesdays 11 am–12:30 pm. Our group offers a safe and supportive environment conducive to sharing about topics such as emotional and physical recovery after birth, expectations surrounding being a mother, changes in lifestyle and in relationships, finding support and trusting caregivers, life balance and sleep, navigating medical care, child development, play and temperament, among other topics and issues. Drop-in for children ages 1–5 on Wednesdays and Thursdays from 9 am–noon during late summer and into spring. All the mats will be out with push and pull toys, balls and obstacles to play on. Parents and/or caregivers must attend. No registration necessary. Exact change appreciated. Studio 4 Art offers drop-in hands-on art and crafts for all ages. Cal Star Gymnastics offers drop-in fun for ages 5 years and under on Monday, Wednesday, and Thursday from 9:30–11:30 am (fall through spring only). Weekend drop-in takes place Saturday and Sunday from 9–10:30 am (year-round). Participants can run, jump and play in an open gymnastics environment. Redwood Empire Gymanstics offers drop-in gymnastic classes for children ages 1–3.5 years. You and your child are invited to come and play on giant, soft, fun-filled interactive inflatables during Pump It Up Pop-In Playtime. This is a perfect outing for your next playgroup. Families looking for active indoor fun should head up north to Rohnert Park and check out the new Rebounderz Indoor Trampoline Arena with a dedicated toddler play structure. Drop-in to the doodlebug Art Studio to create a special piece of art at your own pace. All ages welcome! No reservations required. The new Little Tree in San Anselmo offers open studio sessions for both kids (ages 2 and up) and adults, as well as movie nights, camps, and more. Play-WEll TEKnologies in San Anselmo offers drop-in LEGO play during the week. The Presidio's House of Air indoor trampoline park offers a variety of programs for little ones. Reservations for trampoline sessions are required. Reserve weekend time slots in advance as they sell out! They're located in an historic aircraft hangar at Crissy Field. I Made It! offers countless different art projects ideas that you make from colored glass. Come on in (no appointment or reservation is necessary) and choose a project—including jewelry, decorative items, housewares like coasters and bottle openers, photo frames, key chains, and more. Closed on Tuesdays. Read about our visit to I Made It! Drop-in indoor play is for ages birth to 2 years. JymBABIES offers little ones a soft indoor playground for climbing, crawling, sliding, bouncing in a bounce house, building, dancing, scooting and more. On-site cafe offers kid-friendly food and snacks. Jumping Jacks drop-in program for children crawling–4 years takes place on Tuesdays and Thursdays. Jump-up (for children crawling–26 months) class is from 9:30–11:30 am. High Jump (for children 26 months–4 years) is from 10:30–11:30 am. Jumping Jacks is an hour-long class that consists of activities that encourage creative movement, balance and hand-eye coordination. These activities are done in a high-energy, fun-filled atmosphere. The first half of each class is free play and the last half hour of class is group time… have fun dancing with scarves, playing with the parachute, and of course popping bubbles! GymWorld offers Open Gyms for Toddlers on a drop-in basis three days a week: Monday, Wednesday, and Thursday 10:30 am–12:30 pm. Come run, jump, bounce, swing, use the foam pit and trampoline! The Children's Museum of Sonoma County provides hands-on, interactive exhibits and activities in a safe environment that are custom designed for families with children aged ten years old and younger. Closed on Tuesdays. The new Epicenter indoor sports complex offers a variety of activities, from a trampoline park to indoor sports courts. There's even an on-site restaurant and a Starbucks, too. Snoopy's Home ice in Santa Rosa offers a full range of skating activities with both public and private time, as well as a café. You can even visit the nearby Charles M. Schulz Museum for more fun! PlayLand is an indoor bounce house playground for ages 7 and under. Come jump in the bouncy zone, play games, have fun at the train tables, or even spend some quiet time in the arts room. There's also free organic coffee, tea, and cookies for the grownups! 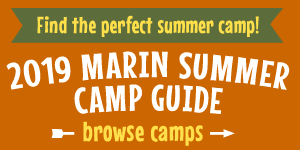 BADM is a perrenial favorite with Marin parents and children. They have a number of different indoor play and activity areas as well as a variety of programs for all ages.